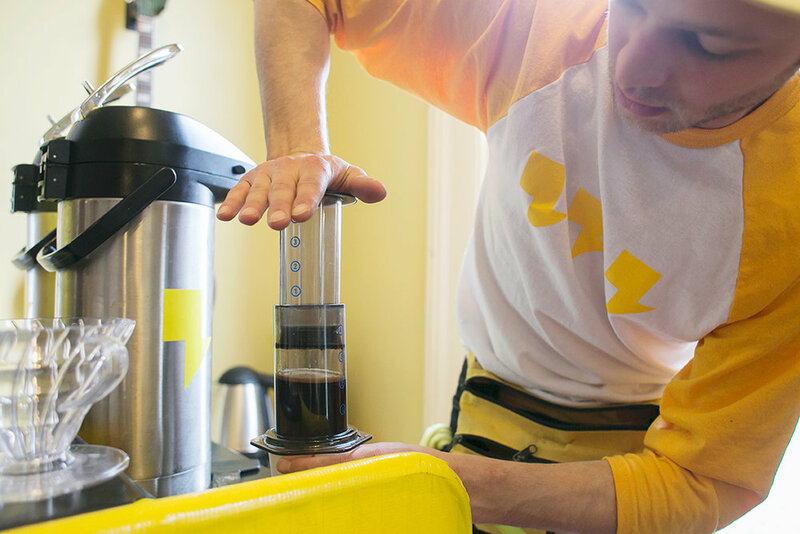 Sam Sveen brews using an Aeropress March 8. Though he is known for cold-brewed coffee, Sveen also makes hot coffee on his cart. Sveen’s cart is the face of his Uel Zing coffee business and allows him to go to customers with his product. Any busy street corner is his storefront. “The most important thing about a location is location, location, location, and with the cart I can put it in whatever location, location, location I choose to,” Sveen said about his uncommon business model. Uel Zing has been operating for just over a year and has become known for its silky smooth cold brew, which until recently was only available from Sveen’s cart. However, customers can now find it bottled in our stores. Sveen said this is the first step in expanding Uel Zing. He explained that the cart is great for getting his brand out there, but the bottles are part of what will make the business stable. Sveen has strong roots in coffee. After graduating from Cornell, he received his barista training at the top-notch third wave coffee bar Gimme! Coffee in Ithaca, New York. Sveen said it was there that he developed his palate and learned the science of coffee. After moving to Bloomington, Sveen said he was not quite sure what he was going to do, but he kept coming back to coffee. After receiving encouragement from family, he decided to take the plunge and start Uel Zing. “Why not [take] a boring barista job, turn it on its head, and become my own boss?” he said of his decision. To make his venture affordable, Sveen had to find ways to streamline the business of making coffee, so he decided to simplify the coffee bar so that it could fit on the back of his now famous pedal cart. Keeping things simple is where the iced coffee comes in. “It is super, super stable and really lends itself to being on a coffee cart,” Sveen explained, adding that, along with its stability, cold-brew is also naturally low in acid. Sveen is expanding Uel Zing slowly, starting with bottles and building from there. Sveen said grassroots support for his business has been key and Bloomington has been great at providing it. “The local thing is very important and Bloomington is a great community because there is a lot of support for local businesses,” he said. Story and photos by Isaac Smith Bloomingfoods Article here, Smith's current venture here, Rooted 12.